Where am I? 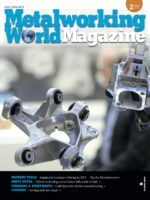 Like humans, robots also need to answer that question, while they tirelessly glue, weld or apply seals to workpieces. After all, the production of precision products depends on robot control systems knowing the location of the adhesive bonding head or welding head to the nearest millimeter at all times. This means the robot needs some sort of eye. In the automotive industry and many other sectors, specialized sensors perform this function, most of which operate on the principle of laser triangulation. A laser diode projects a line of red light onto the workpiece, from which the light is reflected at a specific angle before being detected by a camera. From the position of the light striking the camera chip, the position and distance of the sensor with respect to the workpiece within the coordinate system can be calculated. However, there is a problem with such systems: “Shadowing effect limits the flexibility of existing sensors. They also restrict the freedom of movement of the robot systems and integrating them is very labor-intensive,” says Mauritz Möller, head of the additive manufacturing systems department at the Fraunhofer Research Institution for Additive Manufacturing Technologies IAPT in Hamburg. The only way to measure height with conventional sensors is to mount them along the direction of processing. With these sensors, however, the robot is blind when it changes its direction of movement. Having to predefine the processing direction significantly limits the flexibility of the handling systems. The only alternatives are to use several sensors or additional axes – either of which, given today’s state-of-the-art technology, can sometimes cost more than the robot itself. Mauritz Möller and his colleagues Malte Buhr, Vishnuu Jothi Prakash and Julian Weber have developed an innovative solution called SensePRO. 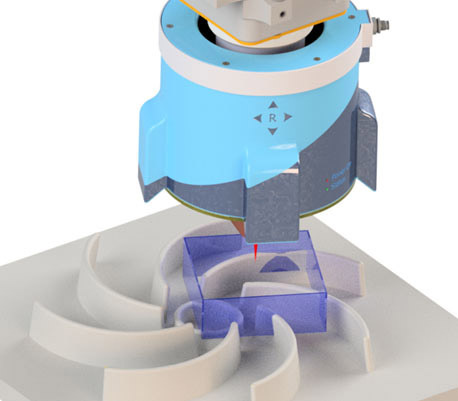 This compact sensor system measures 15 centimeters in diameter and is equipped with specially developed image processing algorithms, thus providing a shadow-free all-round field of view, and generating a 360° measurement field, offering complete flexibility with regard to the direction of measurement. No matter where the robot moves, at least one laser line is always optimally positioned, supplying precise positional information to the camera. This approach also solves another problem – shadowing of the laser light by components with complex shapes. The researchers have now patented the technique. No additional programming is required to integrate the new sensor system in existing robot systems. It can be employed completely flexibly and, above all, reliably in all adhesive bonding and welding processes. The technique significantly simplifies process control and quality assurance – with just one sensor. To operate over long periods in harsh production environments, the sensor contains a cooling module, which utilizes either water or air. To enhance cooling, the optical bench on which the laser diodes and cameras are mounted has an internal cooling structure. Due to its highly complex shape, the only way to produce it is by 3D printing. This intelligent thermal management system extends the sensor’s service life. 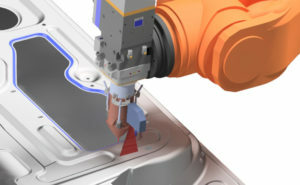 The sensor is designed to fit robots made by all leading manufacturers, from Kuka to Fanuc, and is well suited for any conceivable application scenarios. As a result, it can be easily integrated into existing production systems. SensePRO is expected to be ready for full-scale production in 2021.